It’s that time of year again, winter. With winter comes a whole world of festivities for which you want to give your home the best possible look. With Halloween gone and Christmas around the corner, now is the perfect time to gear up for Christmas preparations. For most people, Christmas decoration is an integral part of their preparation and I am one of them. Why spend a fortune on expensive store bought decor items, when you can do amazing home decoration using dollar store items at a fraction of the cost. 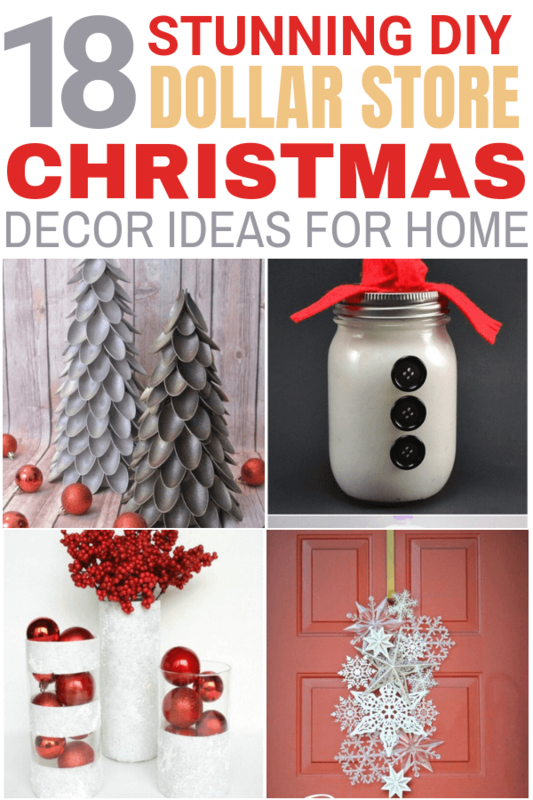 So, here I present 18 of my favorite Christmas decoration ideas using dollar store items. 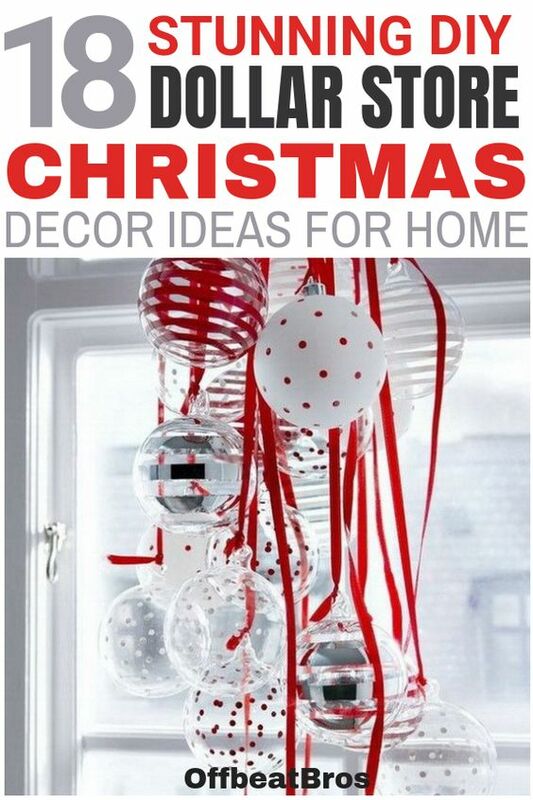 These Christmas decor ideas will make your home look amazing without spending a ton of money. 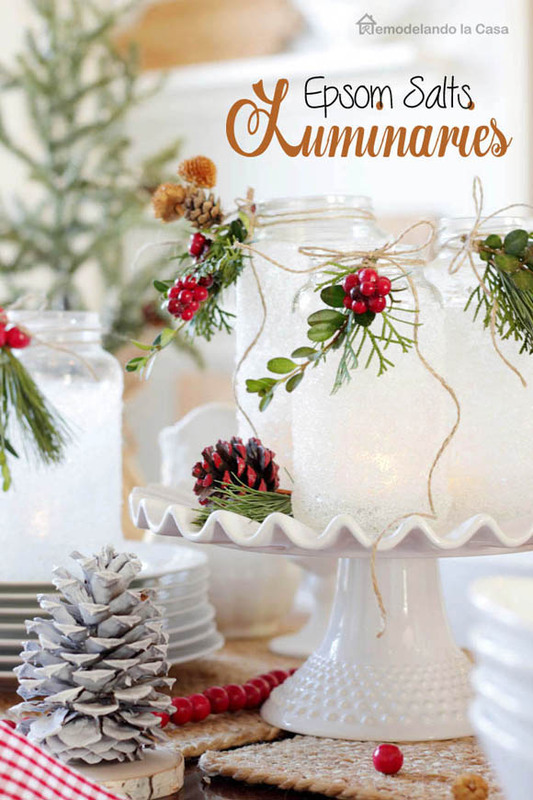 There are wreaths, candles, centerpieces, home accents and much more! 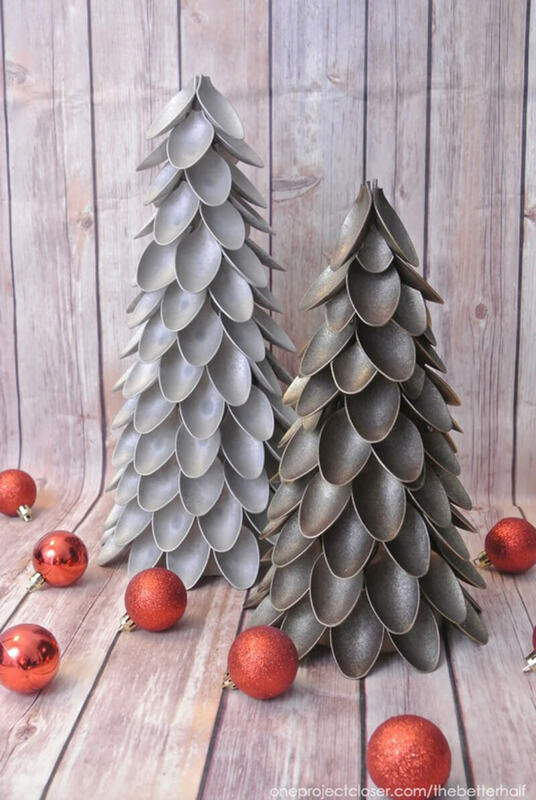 Ever seen a beautiful Christmas tree made from spoons? If not, then make one this year. All you need to accomplish this unique project is plastic spoons, Paper Mache, spray paint and glue. Absolutely love this unique idea and it won’t cost more than $5. Looks intimidating, but you will be amazed at how easy it is to make this Christmas tree using plastic spoons. The Dollar Store always has these amazing berries (not the real kind) that you can use to add a splash of color to flower arrangements. They are the main ingredients to create this amazing Christmas wreath. These berry sprigs are about $1 each. Use as many as you want to make the thickness of the wreath as per your liking. Apart from berry sprigs, you only need a wreath form and some hot glue. 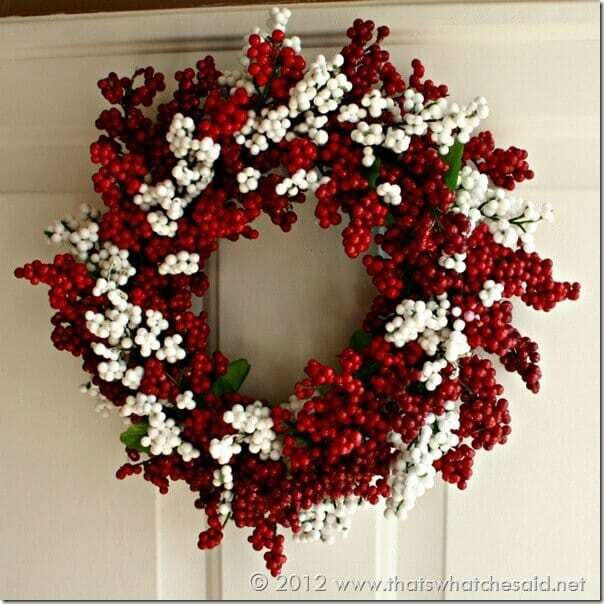 See how easy it is to make this wreath and it looks beautiful with a combination of red and white berry twigs. Another decor idea using berry twigs. 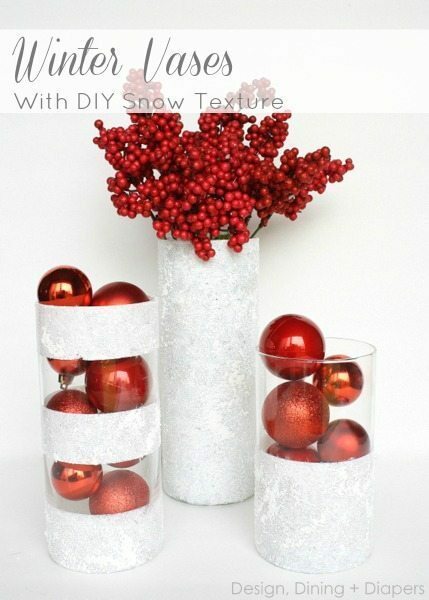 They are absolutely easy to make and would need Snow Tex by DecoArt to create a snowy effect with a brush. You can create the snowy effect in whatever pattern you want and then fill them with ornaments, pine cones, whatever you wish. What more, they would also make perfect Christmas gifts for anyone all under budget as it costs just around $2 to make. Not to mention handmade gifts have a unique charm. Never thought leftover cupcake liners can be so useful. All you need is leftover cupcake liners or get some from the dollar tree to make these beautiful garlands using them. You can use yarn, or any other type of string to hold the liners. To create a fuller effect, alternate the way the liners face on the twine: back to back, front to front or you’ll end up stringing the liners for a long time to get the perfect length. Great for Christmas tree or mantel decoration. Epsom salt works great as paint for art projects. Making luminaries using Epsom salt is a cool idea, and it looks great everywhere be it weddings, holidays, winter, or even a beach themed porch!Making them is easy and fast too, all you need to do is to apply Mod Podge on glass jars and then roll over the jars in Epsom salts. Done! Easiest DIY Christmas Craft is ready! 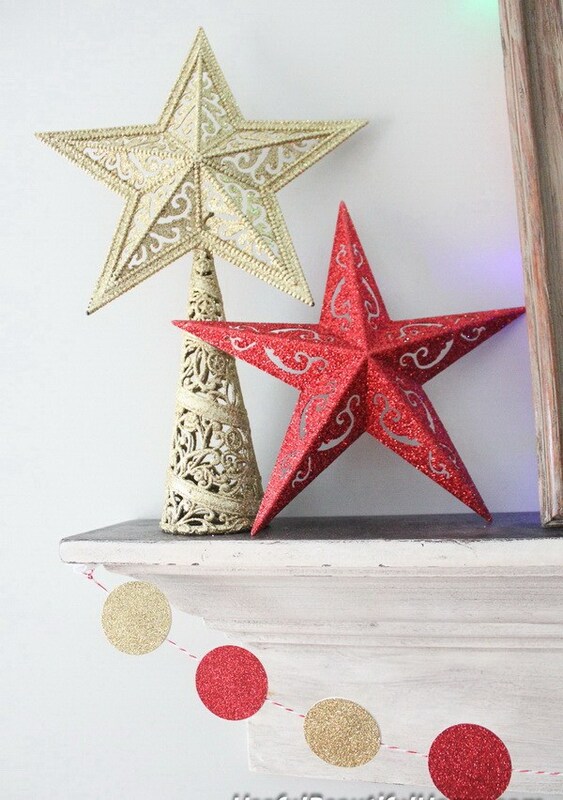 These glitter stars can be the DIY toppers for your Christmas tree or just let it alone for your home, mantel decoration! Here is a tutorial covering how easy it is to make them. 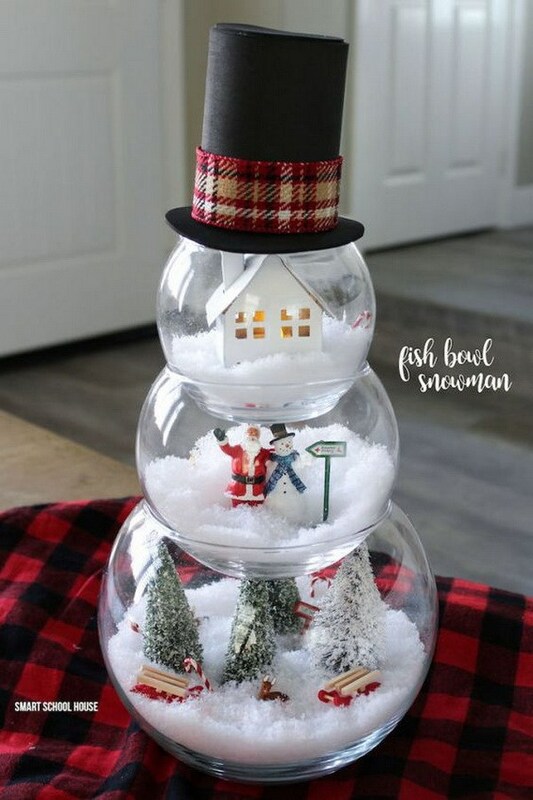 A beautiful creation using fishbowls and fake snow. What else do we need? Here is a tutorial covering step by step process to make this amazing snowman. These DIY candlestick holders are gorgeous. Plus, they are so easy to make and you can create one for around $2. Pretty cheap! All you need to do is to just glue the candlestick to the glass candle holders. Top them off with ribbon and fill with candles, candies, or whatever you want. Beautiful, cheap and easy to DIY. Want to make a luxurious version of candlesticks? These inexpensive candlesticks can look like you bought them at a high-end department store when you add just a bit of glitter. It’s so easy that your kids would also love to help! Love it! 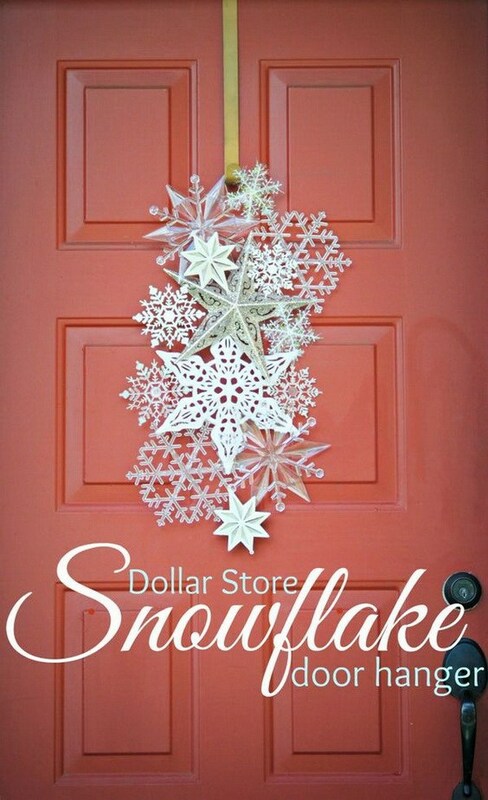 An elegant door hanger made with snowflake ornaments! Super easy and quick to put together! Here is a tutorial on how to go about it. This is a perfect project for those who are feeling lazy. 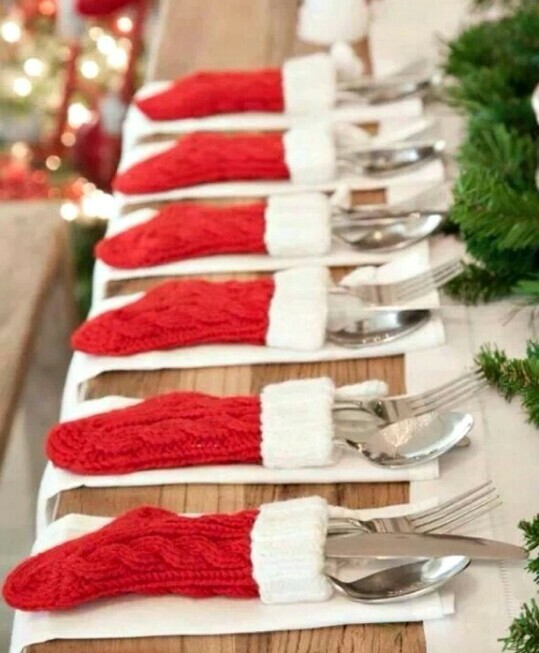 Just pick up a few of those smaller stockings from the Dollar Store (normally around 50 cents each), and use them for utensil holders at your dinner table. They look lovely just the way they are and are the perfect accent for your Christmas dinner. If you want you can decorate them though. Turn any ordinary mason jar into this adorable snowman lotion jar. A good idea for Christmas gifting. You can even fill them with the lotion you get from the Dollar Store and one large lotion jar will fill a couple of snowmen. Or, make it extra-special by filling it with homemade lotion. 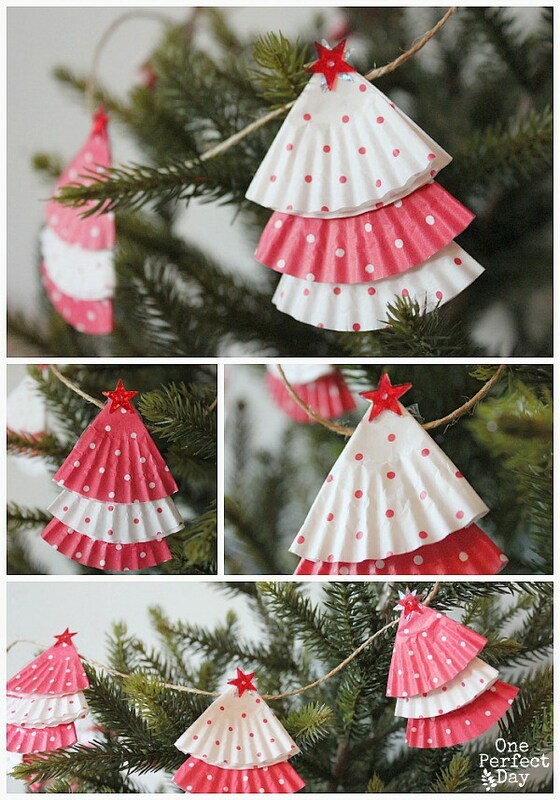 Here is a tutorial depicting how easy it is to make this Christmas craft. 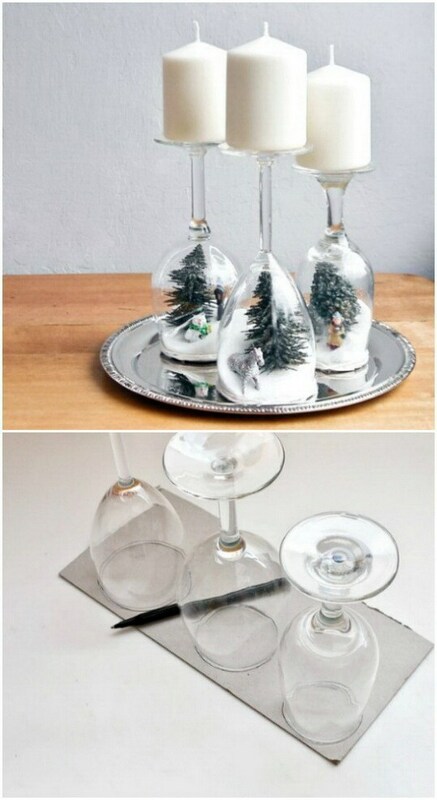 All you need for making these beautiful holiday dioramas are wine glasses, a box of sugar, and a few kitschy holiday figurines. They look lovely adorning your holiday table or mantel topped with dollar-store candles. Here is an easy step-by-step tutorial covering how to make these beautiful dioramas for Christmas. 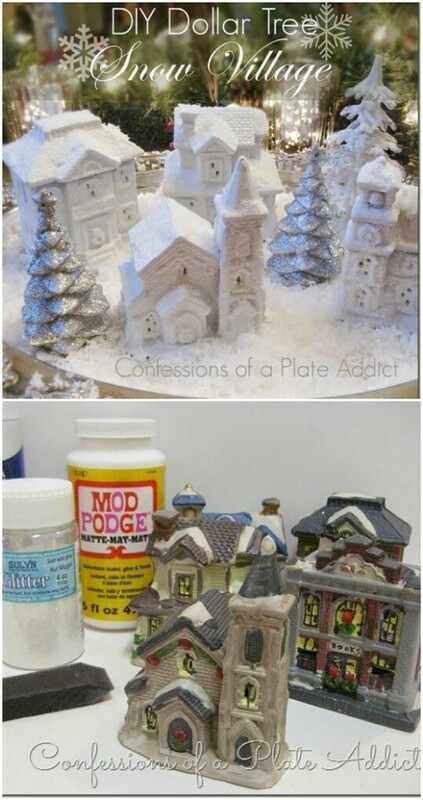 Create this stunning snow village using those really inexpensive village pieces from the Dollar Store and add a snowy effect. With a little Mod Podge and white glitter, you’ve got a gorgeous snow village that will perfectly accent any table, mantel, or bar. Add some white or silver trees and fake snow and you’re all set. See how easy it is to make this snow village. Just like DIY Snow Village, this illuminated forest shadow box will perfectly accent any table, mantel, or bar. The best thing is it is extremely easy to craft this Christmas decoration and here is a step-by-step tutorial for it. Don’t forget the windows for holiday decoration. Simply decorating your windows with a bunch of holiday ornaments and ribbons will make it look gorgeous. 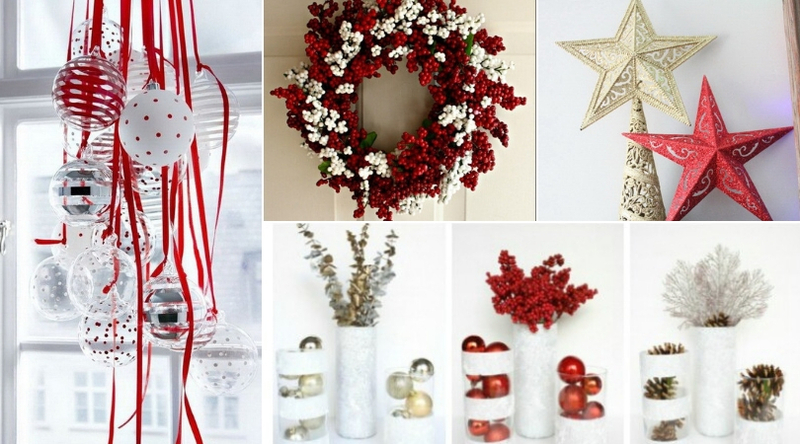 Easy to do but so festive and cheerful for the holidays! Toothpicks are so cheap, you can get hundreds of them for a dollar. 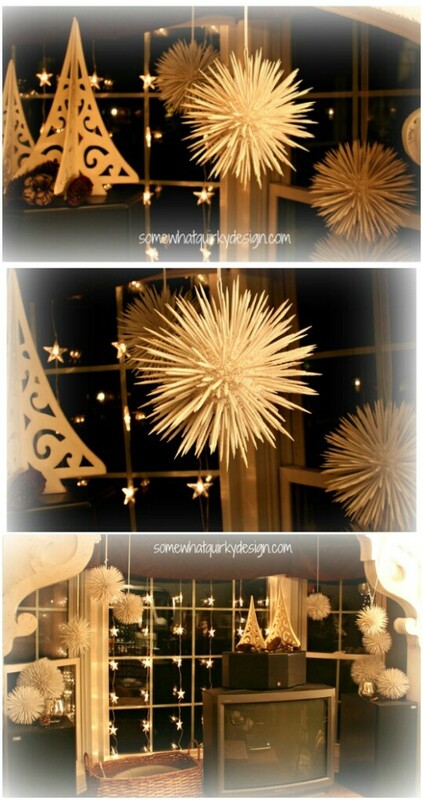 Create these really unique Christmas snowball ornaments using those toothpicks. All you need to do is to grab a few Styrofoam balls and get started sticking in those toothpicks. Create a design or just cover the entire ball. Absolutely love them! They are a bit time consuming but extremely easy to make. 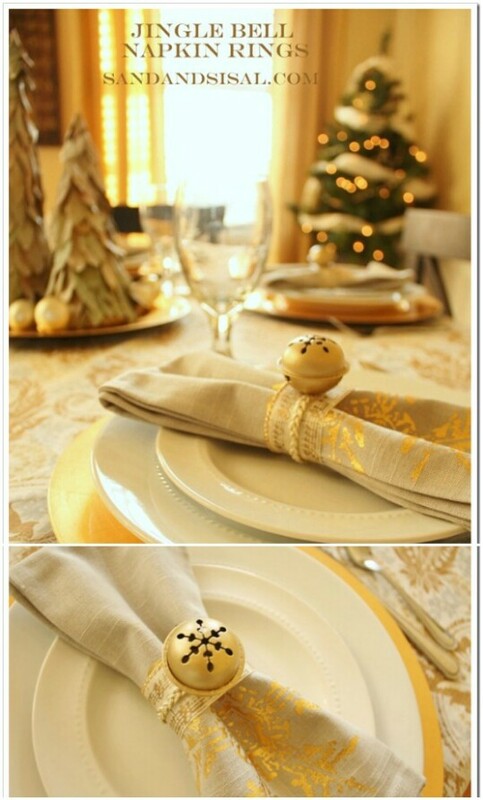 Make your dinner table look elegant with these golden jingle bell napkin rings. All you need are jingle bells easily available at most Dollar Stores. Then just attach them to your ribbon and you’ve got a lovely place setting for all your holiday meals. 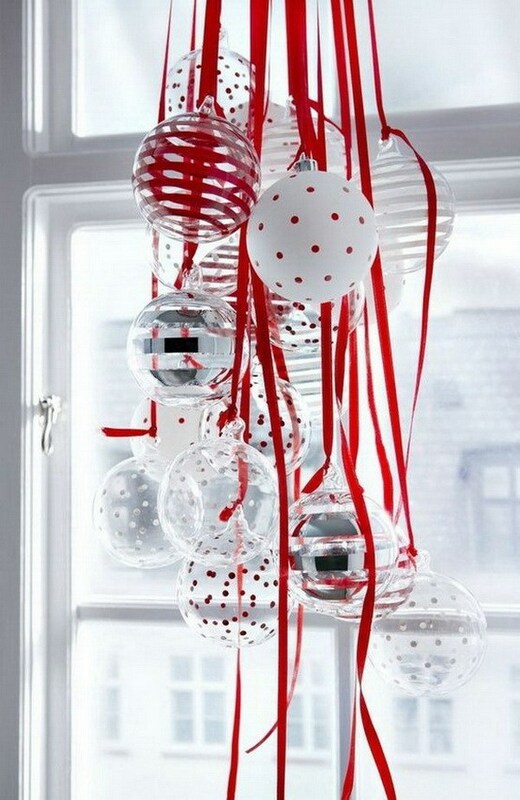 Jaw dropping decoration for Christmas is possible without spending a fortune! 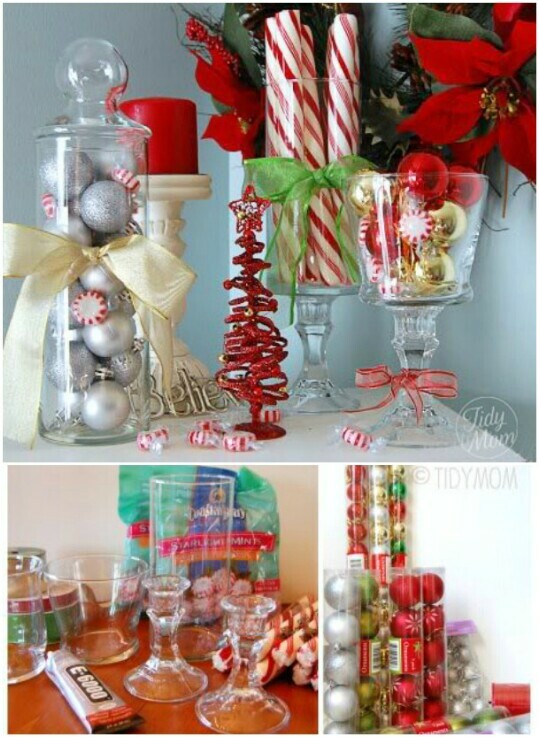 If you like these amazing dollar store Christmas decorations, share the post!